Girl with MS - Tips & Tools for Thriving with Multiple Sclerosis: Chamomile Good For MS! Easy to make! Get some fresh chamomile flowers at your local farmers market or grow them yourselves and add a handful to some water. Let it chill. You go chill. Come back later and taste this delicate living water ready to heal what ails you. 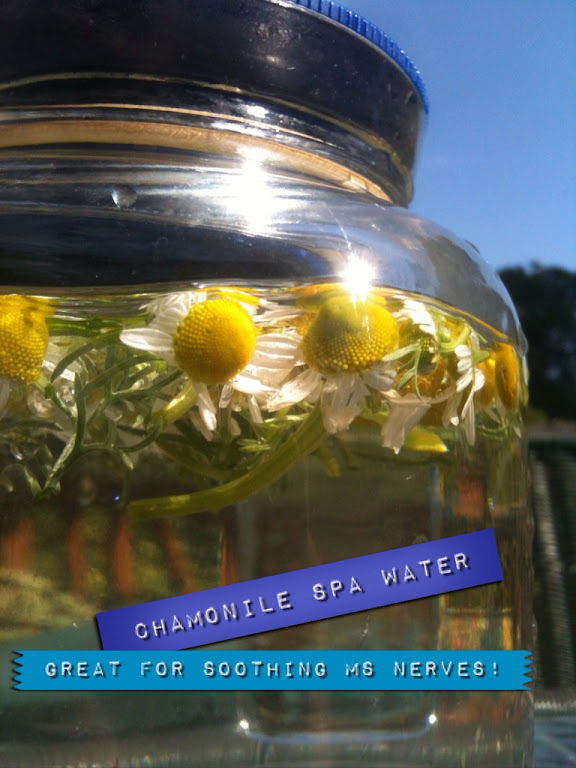 Chamomile good for MS nerves, spasms, anxiety and more. Can be used internally or externally. I'm making an external batch out of the stems. Great for a bath soak later. I'm making a fresh batch for drinking. I never much cared for chamomile tea. But the infusion from fresh flowers is a different taste all together. Hello, How long does it take to grow Chamormile flowers. I'm thinking about getting some because I love them! That's a good question! Usually find my flowers at farmers market. I also have some in the garden but they're taking their own sweet time to flower! I also use Roman Chamomile essential oil for the same calming effect. Chamomile works with MS!